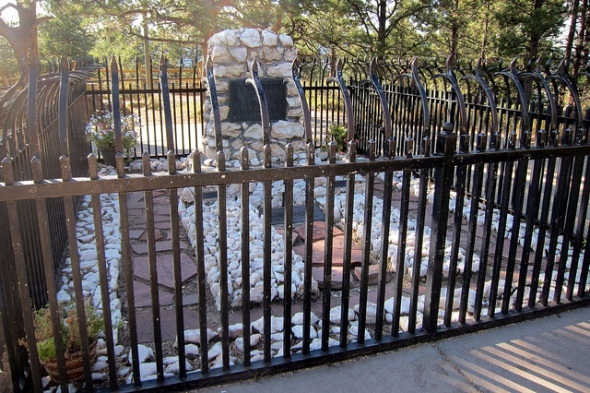 The Buffalo Bill Museum and Grave on 7,581-foot Lookout Mountain focuses on William “Buffalo Bill” Cody, the soldier and buffalo hunter who earned worldwide fame for his Wild West shows. Cody died in Denver at the age of 70 and was buried on the mountain. The museum’s permanent exhibits illustrate Cody’s life, his death and burial, his relationship with Native Americans and firearms from his era. There also is a kids’ area. The museum’s artifacts include the Stetson hat worn by Cody for the last performance before his death and outfits worn at his shows, the head of the last buffalo Cody shot, a peace pipe and bow and arrows that belonged to Sitting Bull, and Frederick Remington’s “Portrait of a Ranch Hand” painting. Cody’s grave looks out on the Great Plains from the foothills of the Rockies west of Denver. His burial in 1917 drew 20,000 mourners to the site, and tributes came from King George V of Britain, Kaiser Wilhelm II of Germany, and President Wilson. Cody, who grew up in the Kansas Territory, served as a Pony Express rider and a scout for the U.S. Army. He earned his nickname by killing 4,280 buffalo to feed workers on the Kansas Pacific Railroad during eight months from 1867 into 1868. Cody’s Wild West shows ran from 1883 until 1913, providing circus-like performances with a romanticized version of the American West to audiences in the United States and Europe. The performers included sharpshooters Annie Oakley and Gabriel Dumont, and Sitting Bull and 20 of his Sioux braves. The show’s finale was typically a portrayal of an attack by Native Americans on a white settler’s cabin, with Cody riding to the rescue. Cody, whose shows visited 1,400 communities in North America and Europe, became a popular culture icon, later inspiring television series and songs. The Buffalo Bills of the National Football League and the town of Cody, Wyo., were named for him. The museum is run by the City and County of Denver.